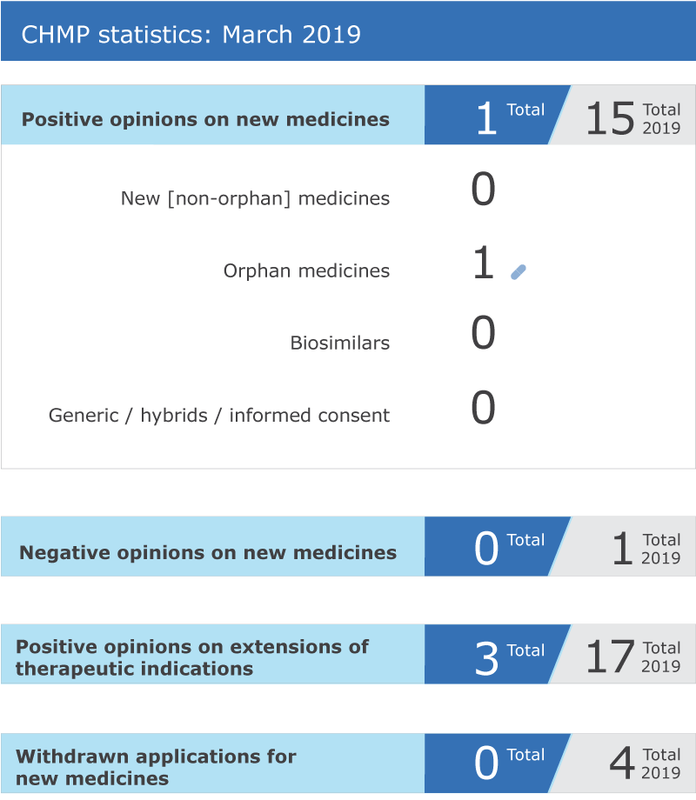 EMA’s human medicines committee (CHMP) adopted recommendations for one new initial marketing authorisation and three extensions of indication at its first meeting in Amsterdam in March 2019. The Committee recommended granting a conditional marketing authorisation for Zynteglo (Autologous CD34+ cells encoding βA-T87Q-globin gene), an advanced therapy medicinal product (ATMP) for beta-thalassaemia, a rare inherited blood condition that causes severe anaemia. Zynteglo is intended for adult and adolescent patients 12 years and older who need regular blood transfusions to manage their disease and have no matching donor for a stem cell transplant. Since Zynteglo addresses an unmet medical need, it benefited from support within the PRIME scheme, EMA’s platform for early and enhanced dialogue with developers of promising new medicines. This interaction led to a more robust application package which allowed accelerated assessment of Zynteglo in 150 days, the fastest review time for an ATMP to date. Zynteglo was designated as an orphan1 medicine during its development. For more information, please see the press release in the grid below. The Committee recommended extensions of indication for Imnovid, Mozobil and Revlimid. The CHMP confirmed that omega-3 fatty acid medicines containing a combination of an ethyl ester of eicosapentaenoic acid (EPA) and docosahexaenoic acid (DHA) are not effective in preventing further problems with the heart and blood vessels in patients who have had a heart attack. This is the outcome of a re-examination requested by some of the companies that market the medicines concerned, following the Committee’s original recommendation in December 2018. The agenda of the March 2019 meeting is published on EMA's website. Minutes of the February 2019 CHMP meeting will be published in the coming weeks. Key figures from the March 2019 CHMP meeting are represented in the graphic below. 1 As always at time of approval, this orphan designation will now be reviewed by EMA's Committee for Orphan Medicinal Products (COMP) to determine whether the information available to date allows maintaining the medicine’s orphan status and granting the medicine ten years of market exclusivity.